Carcar: Down to the Last Crunch! Can you blame us? Who goes to Cebu and not try its lechon and chicharon? If the best Cebu lechon comes from Talisay (I know, I know, I’d get lotsa flak writing this), then don’t argue with me when I say the best Chicharon hails from Carcar. Chicharon pa lang, ulam na! It’s more fun in the Philippines, indeed! 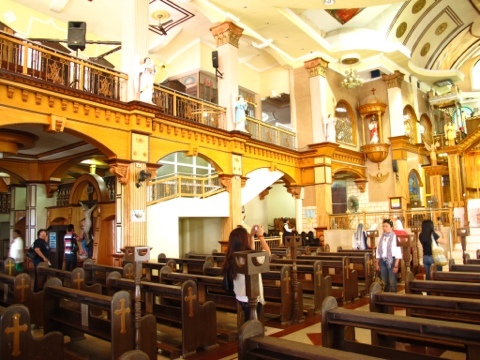 But make sure you do Visita Iglesia in Saint Catherine of Alexandria Church to spare you from hypertension resulting from cholesterol overload. At the time we visited, the parish was closed. Thus, we appreciated its beauty — styled like most Greek Orthodox churches with onion-domed bell towers — from the outside where we also found many statues of saints adorning the fence around the church. 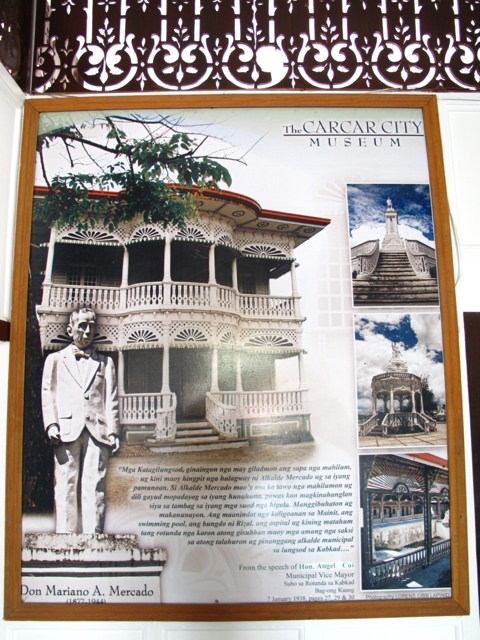 Right beside the church is the Carcar Museum. Yes, a Museum! Well actually, an American-styled dispensary years before and now converted into a lovely Museum complete with various illustrations tracing its history in this heritage capital of the province of Cebu. The Carcar Rotunda is also as American as the Carcar Museum. 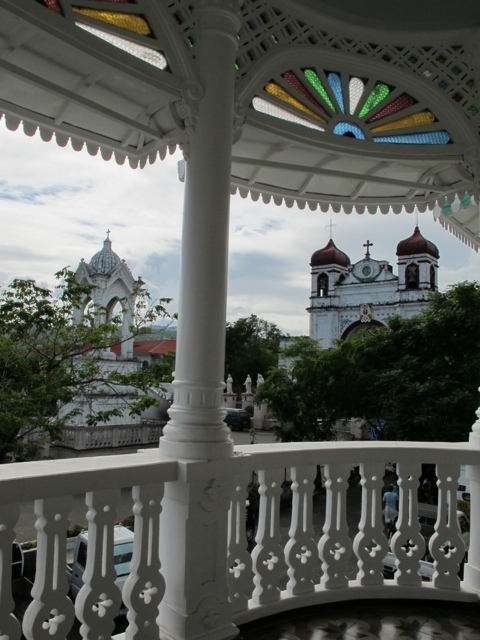 This white gazebo stands right before the church and the museum, which together comprise a most charming plaza. 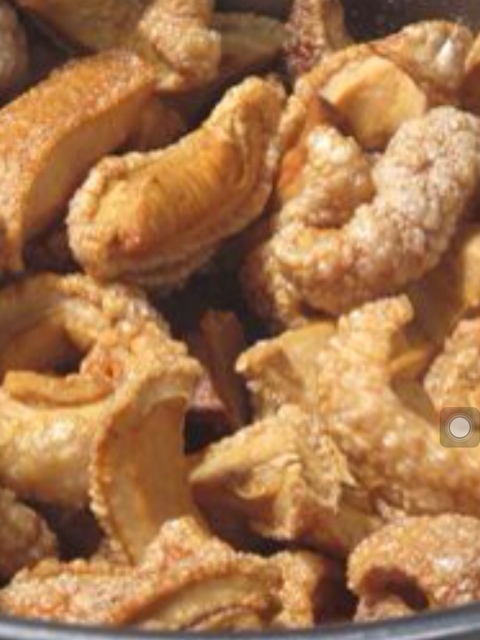 Where to buy Chicharon? No worries. They’re everywhere! Inside the malls, outside the malls, along the streets, inside your bus or cars! The prices are no different though from the crunchies you can buy back in the city just an hour’s ride away. It is not known though that Carcar was once what Liliw is to Laguna, or Marikina to Rizal (now Metro Manila). Somehow, this 17th century shoemaking industry faded from the scene as competition set in and other industries flourished. Just off the Plaza, and visible from the porch of the Carcar Museum is the town’s oldest house. 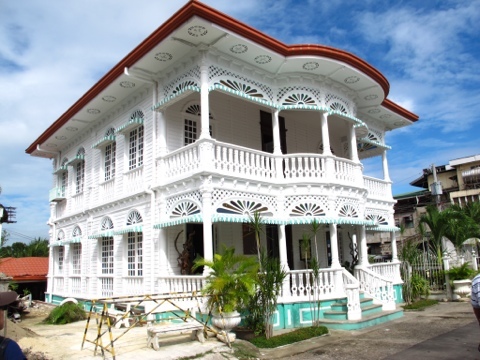 Owned by Don Florencio Noel, the house is still lived in and is fondly called by Carcaranos as “Dakong Balay” which literally means “big house”. 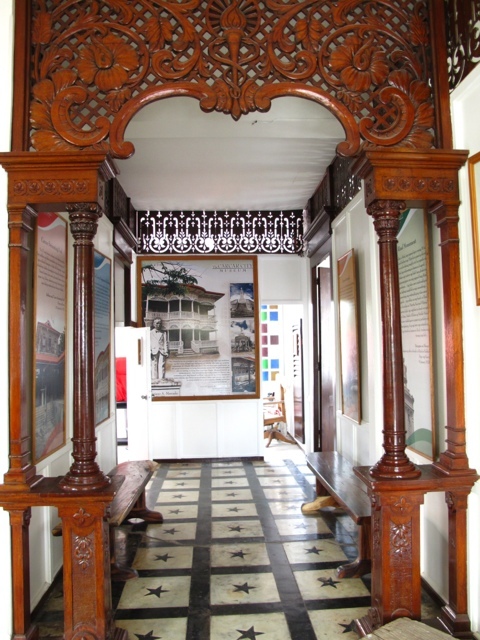 Now declared by the National Historical Institute as a heritage house, the house remains unaltered but lovingly restored and preserved by fourth generation descendants of the Noel family. 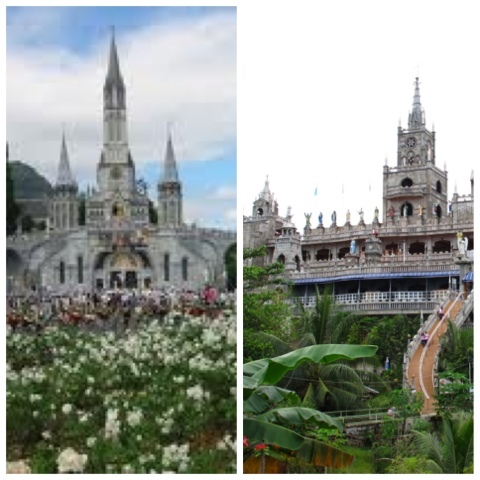 If you have been to Lourdes in France, you would be reminded of such Marian pilgrimage site when you visit Simala or Monastery of the Holy Eucharist in Southern Cebu. 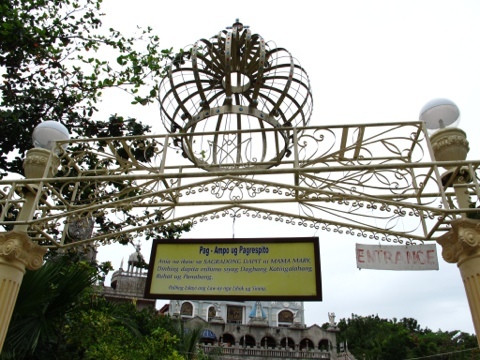 Run by Mongha ni Maria (Monks of Mary) who tend the gardens and built a mini-falls within the compound, the church has also since been a pilgrimage site. 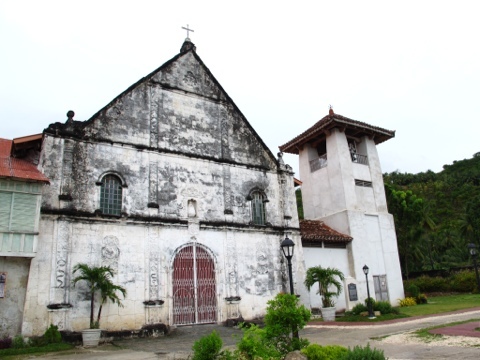 This church in Sibonga, Cebu drew crowds when the miraculous statue of Mama Mary shed tears of blood. 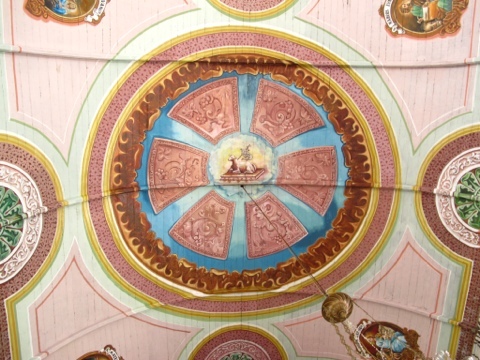 Though not validated by the Church, this phenomenon drew many faithfuls to the site. 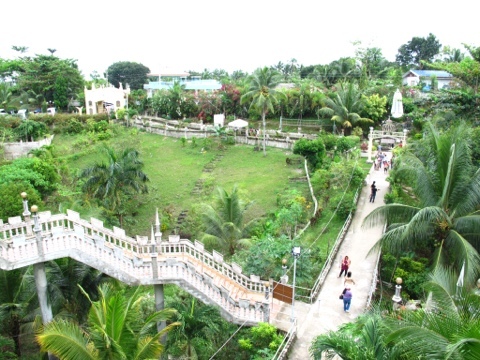 I tweeted about this trip to Cebu and some tweeps advised me to go visit Simala on our way back to the city. It’s just slightly off the way and in between our Dalaguete and Carcar stopovers, but since we hired a van for the day, it worked out well. We felt good making this stopover. 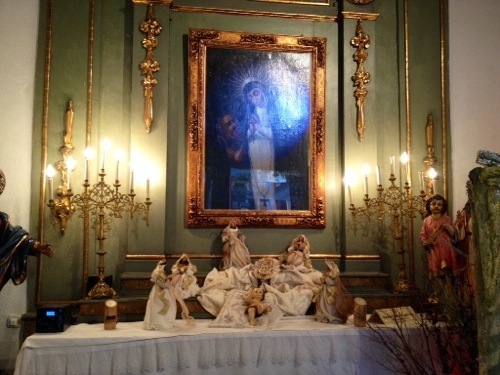 And there was even a Mass when we visited. Hard to believe a church of this size was built in this corner of the province. 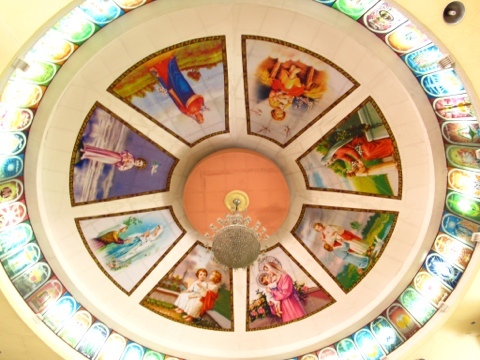 The story goes that funds were provided by faithfuls who were miraculously healed here. 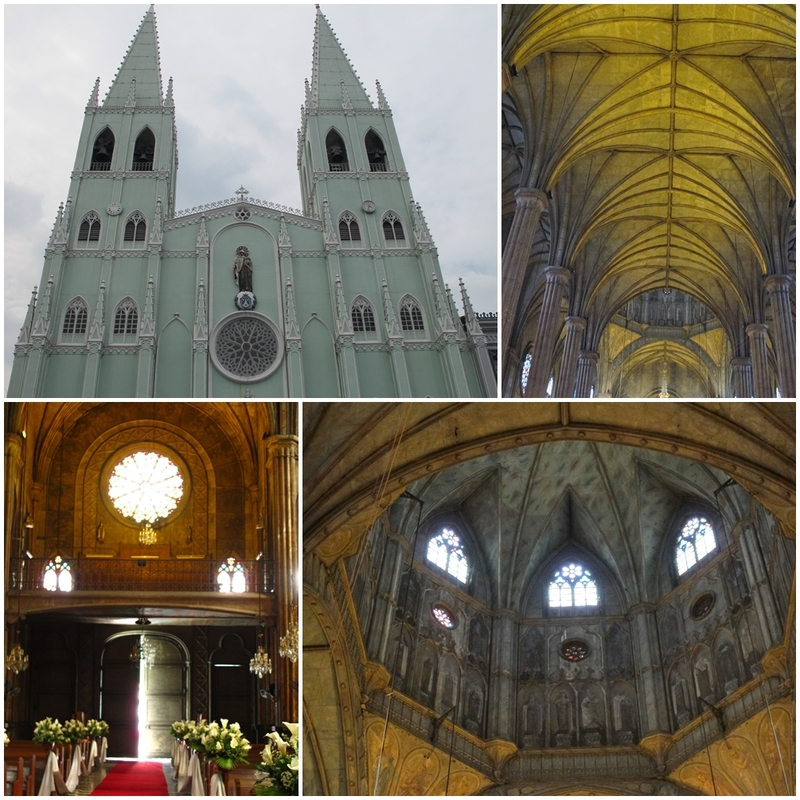 If you are a first-time visitor like we were, you’d be awed by the grandeur of this church. Not just in the exterior appearance with the curving staircase and footbridge wrapped around the church, but in the interiors as well. We waited till Mass was over before snapping these photos. 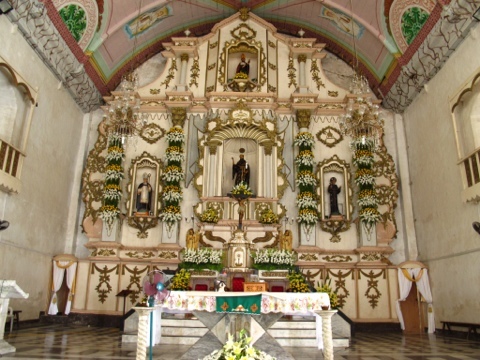 So, next time you are in these parts of Southern Cebu, make time to do this pilgrimage. All you need to bring with you is your faith and perhaps, countless petitions for divine aid. We didn’t plan on visiting Dalaguete. 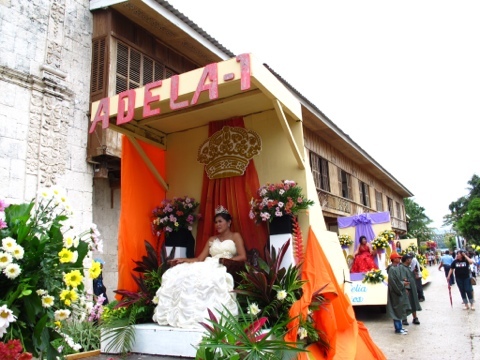 Much less visit it on its town fiesta which is celebrated every 9th and 10th of February. 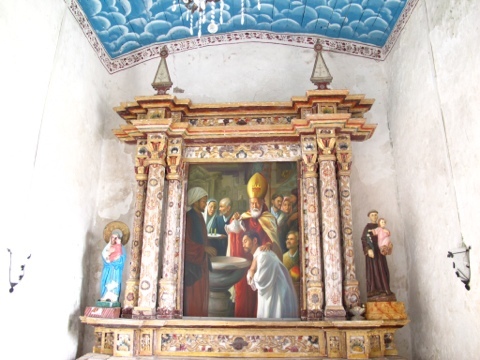 Yet there we were, witnesses to all that revelry in honor of its patron saint, San Guillermo de Aquitania. 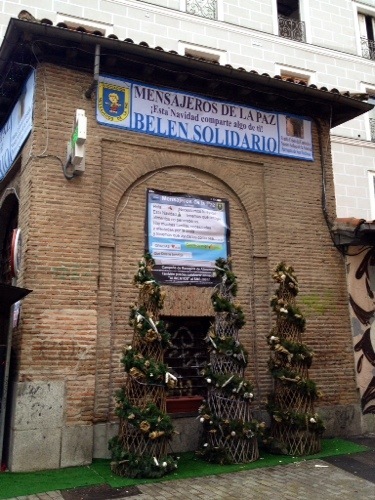 As with similar town fiestas, Utanon is the Dalaguetnons’ way of showing gratitude for all their blessings. Through dance and music, they celebrate the town’s good harvest as Dalaguete is Cebu’s vegetable basket much like Baguio is in Luzon. 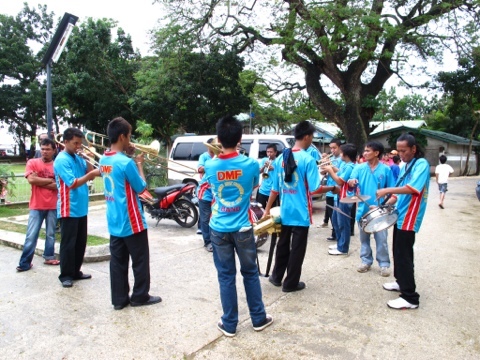 It is also alleged that Dalaguete is the Music Capital of the island. 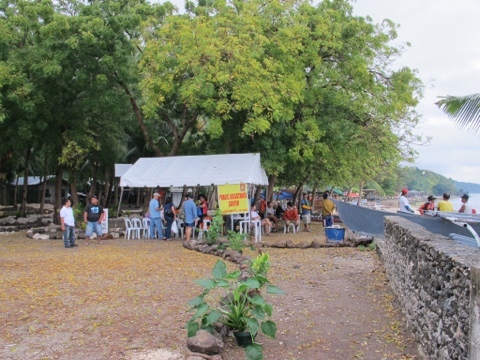 The name Dalaguete came from balete, a tree which grew abundantly in the town, and which in Cebuano, is called the dalakit. On the other hand, Utanon means vegetables in the local dialect. 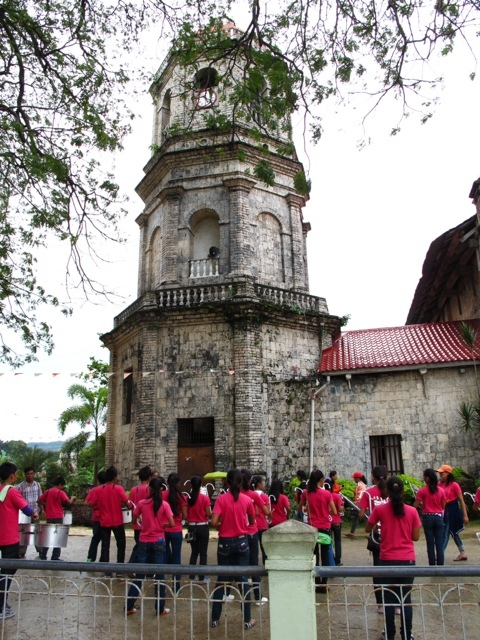 We caught sight of the bands and street marchers/dancers in front of San Guillermo Church. The festive colors of red, blue and green complemented the floats with “Hermana Mayors” gamely waving their hands as they were paraded around town. I have to say that the sight made for a very rural scene….. A village affair. I bet everyone knows everybody in this small town. 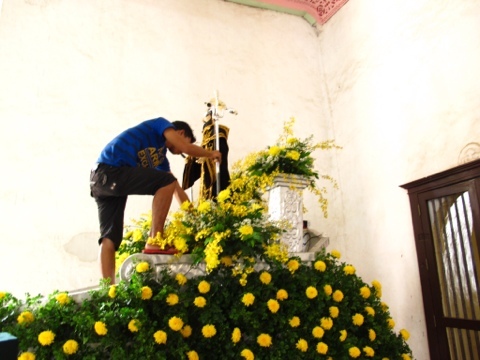 We surmised that the religious procession in honor of San Guillermo is scheduled later in the day as local men were still busy decking the floats with flowers. 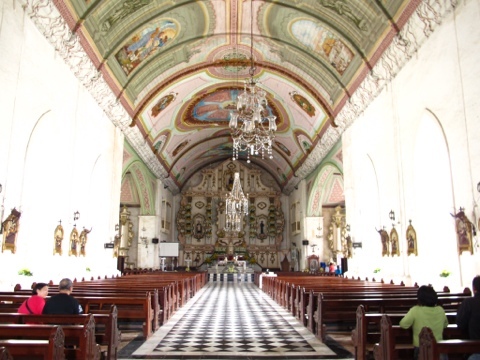 We said a prayer inside this 18th century baroque church with its shell-shaped altar before heading out for one last glimpse of the church and its adjoining convent. Should you come and visit this church, take time to stare up to view one of the few masterpieces by Canuto Avila, a 19th century maestro who did religious murals for 20 or so churches and convents in the Visayas, including the ceiling of Cebu’s Santo Niño Church. Our group planned this 3 day, 2 night adventure in Cebu highlighted by a visit to Oslob. 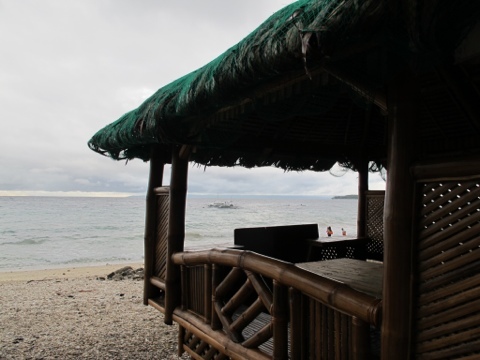 This small, heretofore vaguely known town in Southern Cebu hugged the limelight when it was reported that whale sharks — Butanding in Donsol, “tuki” in Cebu — were discovered. The “feeding” of these friendly gentle giants invited so much attention and excitement that we promptly packed our bags and flew to Cebu. This, even after the disastrous earthquake that rocked Negros and Cebu a few days before our flight. We arranged for a van to pick us up at the new Harold’s Hotel in Cebu City at the ungodly hour of 4am. 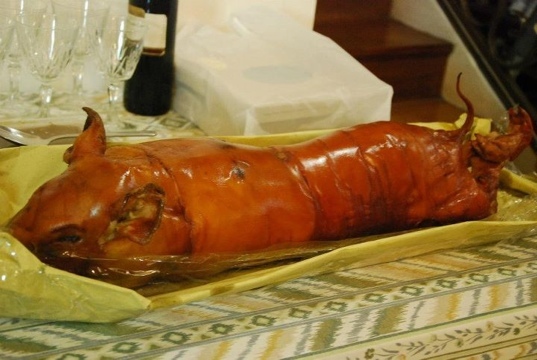 Having feasted on lechon the day before — the day of our arrival — I hardly slept because of a disturbing headache (which I later learned was actually triggered by a spike in my blood pressure) which deprived me of the needed winks. We tried to catch some sleep in the van as we cruised towards Oslob on that 3 hour drive. 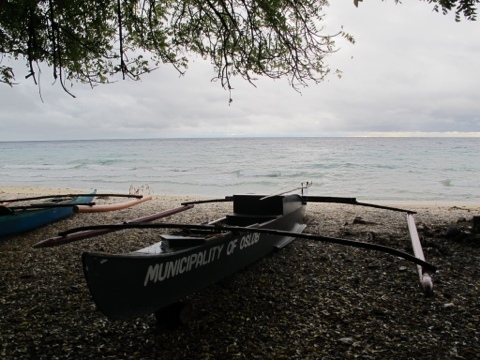 Armed with my own life vest, life buoy and snorkeling equipment (all hand carried from Manila), we were ready eager when we arrived 7am in this remote village. The makeshift registration kiosk wasn’t that busy as it was a Thursday and it was just our group, a family, 2 Caucasian couples and a lone Frenchman arranging for a date with the gentle, krill-fed whale sharks. But it was not to be. We waited another 3 hours, content with stories from this local who regaled us with her own adventures feeding the whale sharks. By 10am, we prepared to leave as the “spotters” who rounded up the area several times came back empty-handed. Disappointed. Frustrated. Deprived of an adventure dreamed of weeks before. Thank God I was in the company of good (and cheerful) friends with whom a day is never dull nor devoid of “adventure”. Now, WHAT TO DO? 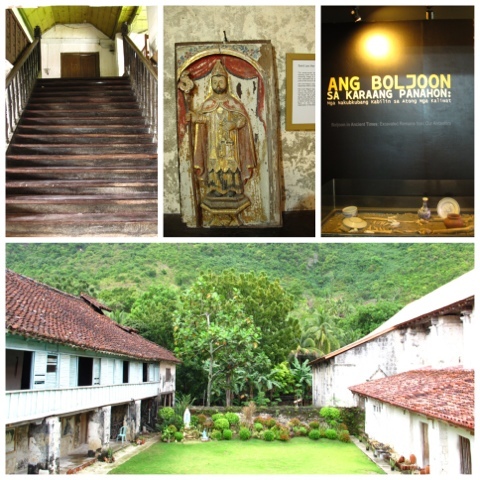 The 3 hour return trip was marked by stopovers in Boljoon, Dalaguete, Carcar and Simala. Separate blogs to follow, as each has a story to tell. 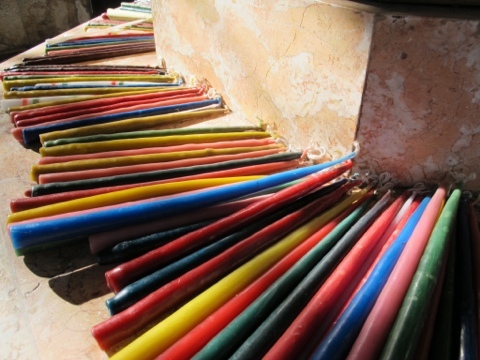 Tuki or no tuki, we certainly didn’t waste our day! When you guys go, better pray you meet them. Pray for good weather. It rained nearly the whole night and early morning of our visit. 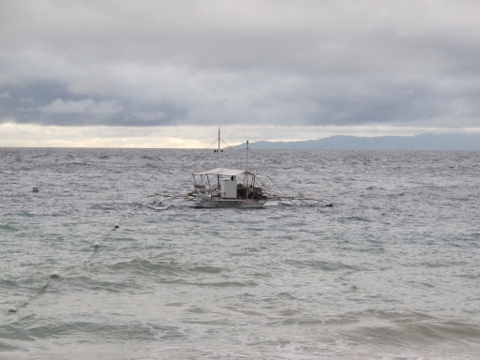 The whale sharks may have been sooo disturbed by the strong current and choppy waters. So, Whatever Happened to Lapu Lapu? So, we recall our history lessons and confidently state when the Philippines was discovered by Magellan. 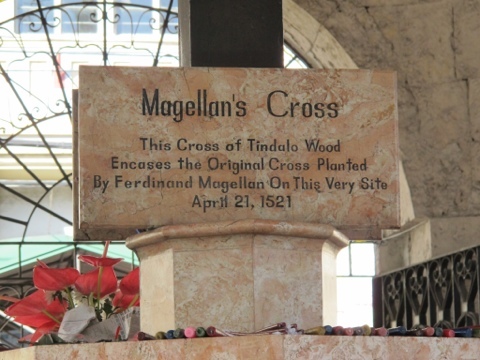 We remember too that Magellan was killed by Lapu Lapu in Mactan. Then WHAT? Our history lessons quizzed us on the dates, on who Magellan was, but failed miserably on educating us on the very first Philippine hero who resisted foreign aggression. Epic fail! Was Lapu Lapu such a nondescript character unworthy of a longer narration in many history books? I bet many in my generation hardly knows this hunk from Mactan! Like me. But I intend to change that. True, the Spaniards brought Christianity to our land. 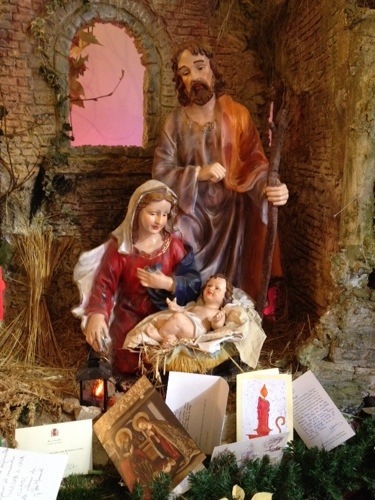 While I take my faith seriously, I have this gnawing feeling……..no, I am absolutely confident that the Spaniards who ruled our land for nearly 4 centuries had motivations more compelling than spreading the faith. But I’m not about to dwell on these motivations. What interests me is to know exactly what happened to our first Philippine hero. The little I know is that Magellan befriended some local tribal chiefs the likes of Rajah Humabon. Lapu Lapu strayed from the pack and refused to succumb to this foreign aggression, as well as to Rajah Humabon’s order to accept the foreign colonizers. 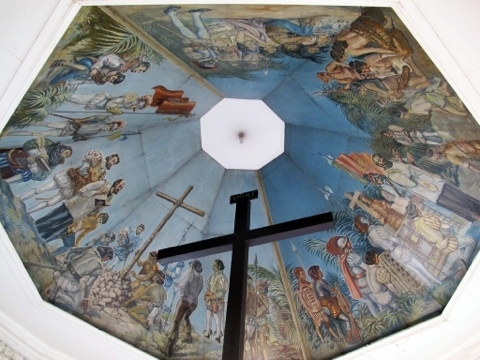 Lapu Lapu organized his warriors as Magellan and his troops sailed to the island of Mactan. Allegedly, Rajah Humabon connived with Magellan to attack and subdue this “rebellious tribe in Mactan”. Fortunately for Lapu Lapu and his tribal warriors, the Spanish fleet, helped along by local “friendly” tribes, could not sail nearer to the island and had to wade ashore where they were met and attacked by Lapu Lapu and his men. The fleet’s cannons and firepower could not support the Spanish troops as the boats were at some distance from shore. 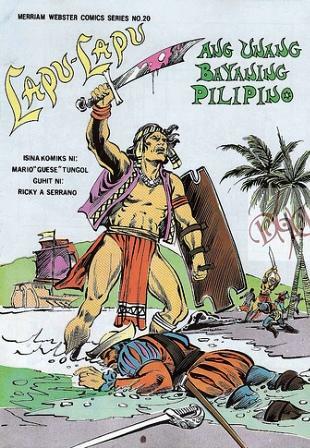 Besides, Pigafetta, the chronicler, claimed the Spaniards were outnumbered by the Mactan “army” of Lapu Lapu. Pigafetta escaped with some others, as Magellan lay helpless and died. His body was never found. Sourced from the Net: Lapu Lapu Killed Magellan! And then what? Now this is where the legends abound. One legend claims Lapu Lapu left the island to live up in the mountains, far from sight. Was he hiding from his fellow Cebuanos who have so readily welcomed and accepted Spanish “visitors”? Of interest here is the report that Rajah Humabon, after Magellan’s defeat and fatal encounter with the local tribes, betrayed the remaining Spanish troops by trying to poison them in a feast he tendered for his European visitors. Oh well. That’s another story. But what of Lapu Lapu? Never seen by anyone ever again. 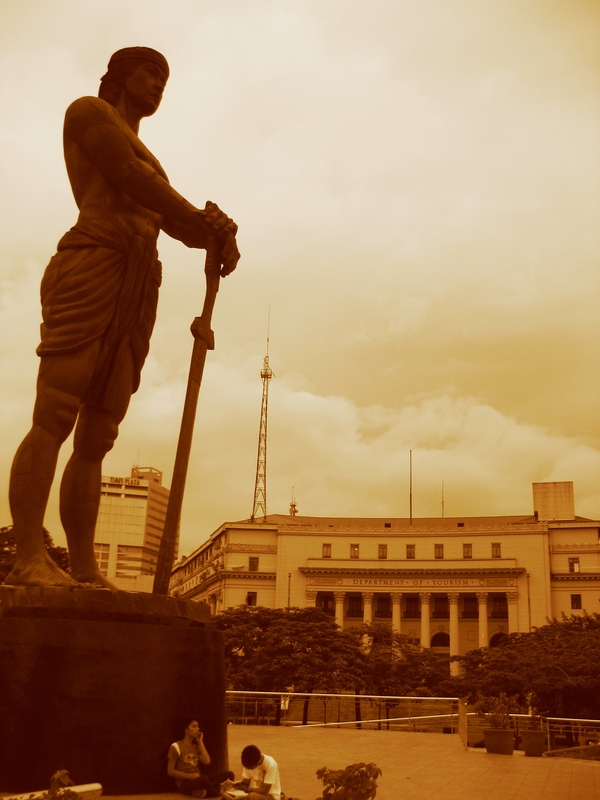 Another legend is more dramatic and attributes superpowers to this Mactan chieftain. 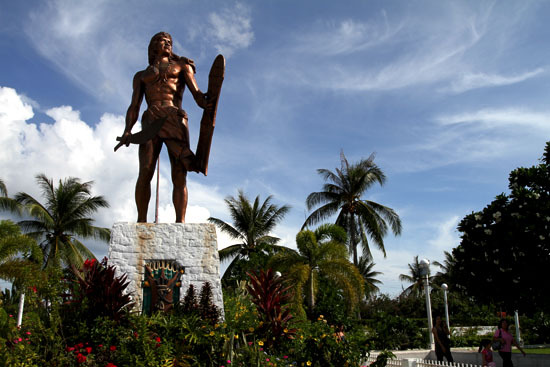 This legend claims Lapu Lapu turned into a stone (or a rock) facing the sea to forever protect the island of Mactan. How’s that for a legend? And how have we honored Lapu Lapu, our first national hero? 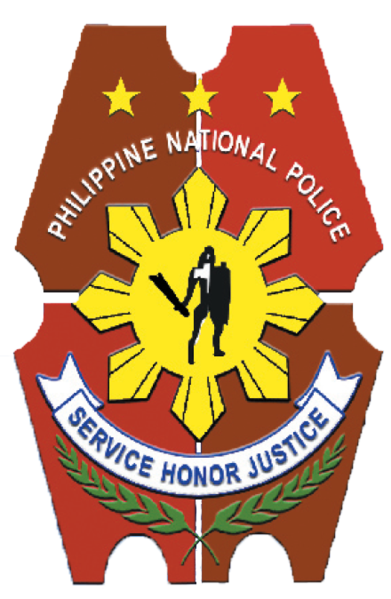 Lapu Lapu appears on the official seal of the Philippine National Police. 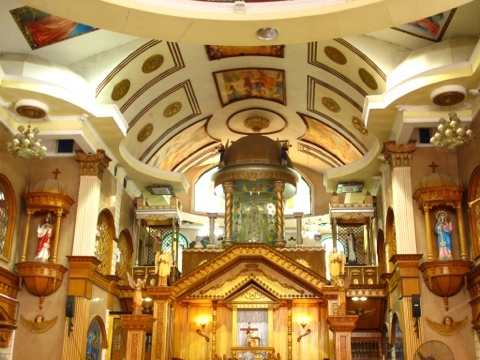 There’s the shrine in Mactan. A Monument in Rizal Park. And don’t forget the fish. Gawd, we didn’t even bother to declare a national holiday in his honor? To be updated, as history unravels. Work In Progress: Photo Walk On The Oldest Oldest…………. This list was emailed to me. Have been to, seen and photographed some but not all. Thought I’d throw in some of these photos here for a photowalk — to inspire us all to visit each site. It’s just around the corner! 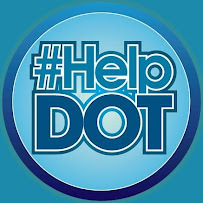 NEED HELP. IF U HAVE PHOTOS AND WANT TO SAVE ME THE TRIP, PLEASSSSSSEEEEE SEND ME. THANKS. 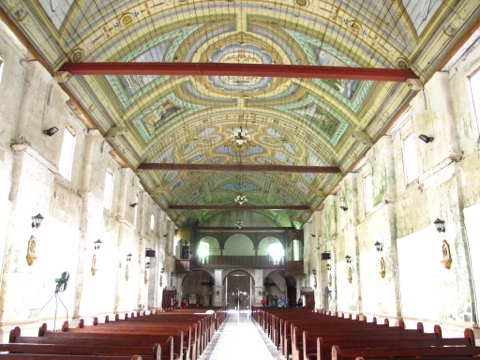 Despite the discrepancies in the dates of its founding, the San Sebastian Church is the only steel church in Asia built in the late 18th century. It should have celebrated its centennial around 1991. Yet, it seems that not even the Catholic administration paid any interest in its historical significance or in the fact that it was Alexander Gustave Eiffel who designed it. New Toho Food Center (1888, 422 Tomas Pinpin Street, Binondo, Manila) Five Chinese friends set this up in Binondo, Manila, where the restaurant still stands, in a newer structure also on Tomas Pinpin (formerly San Jacinto) Street which was built after a fire razed the wooden building back in 1984. That explains the slight change in the name. It used to be called the Toho Antigua Panciteria. 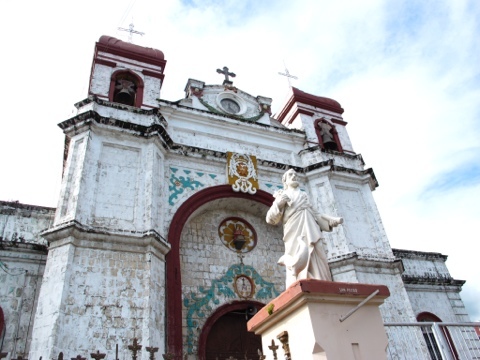 Aklan, originally known as Minuro it Akean, is considered as the oldest province in the country and believed to have been established as early as 1213 by settlers from Borneo. Its first ruler was Datu Dinagandan. 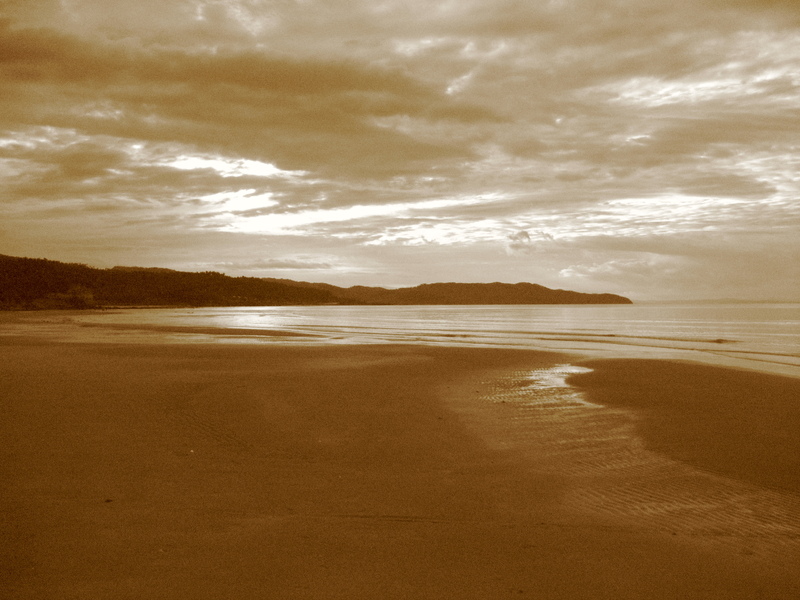 In 1399,Datu Kalantiaw grabbed the throne. In 1433, Kalantiaw III formulated a set of laws that is known today as the Code of Kalantiaw. 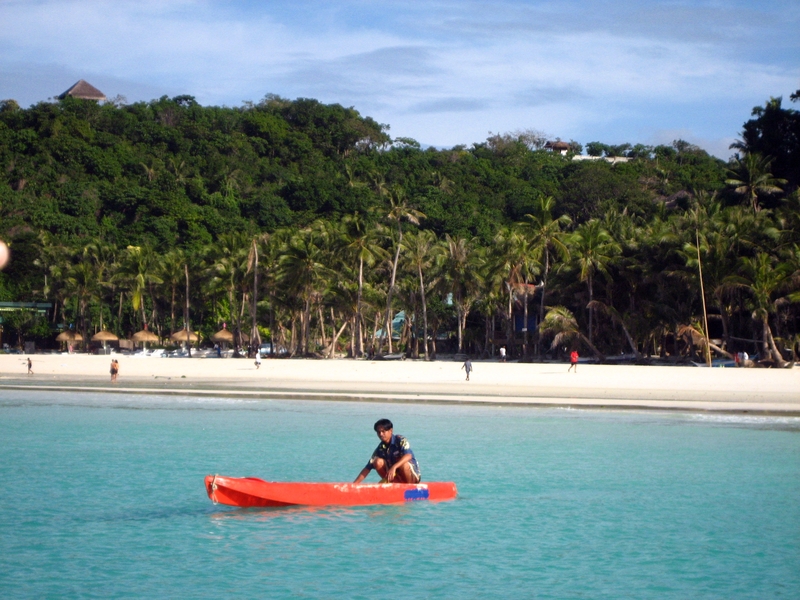 These days, Aklan is better known as the province to which Boracay belongs. 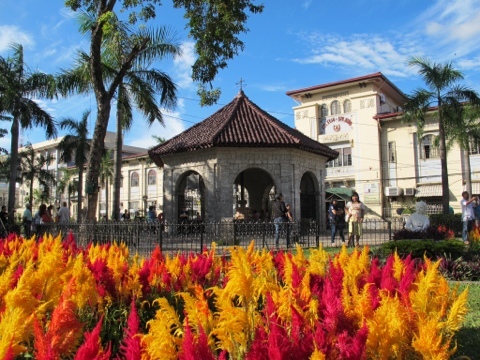 Cebu City is considered as the oldest city in the country, as this was the site of the earliest European settlement established by Spanish conqueror Miguel Lopez De Legazpi in 1565. 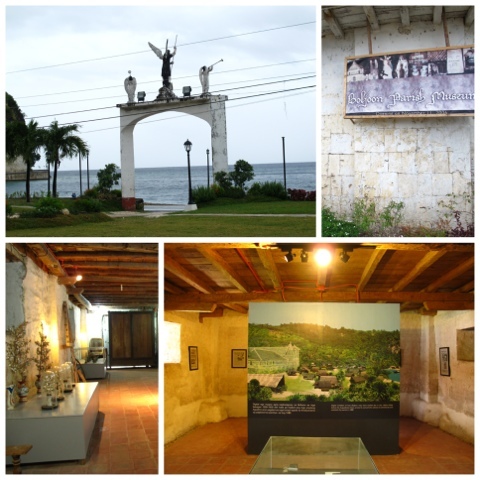 The first Spanish settlement in the country, Villa del Santisimo Nombre de Jesus, was located inside Fort San Pedro in Cebu City. The fort’s construction began in 1565. Calle Colon in Cebu City is considered as the oldest street in the country. 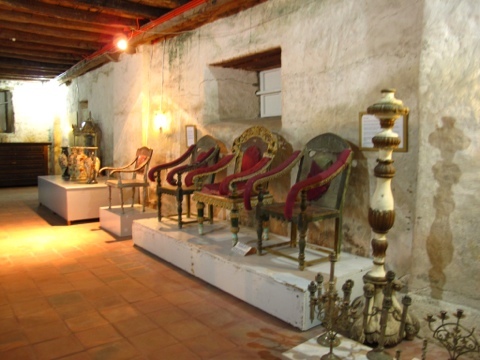 Named after explorer Christopher Columbus, Calle Colon was first constructed in 1565 by men of Miguel Lopez De Legazpi. 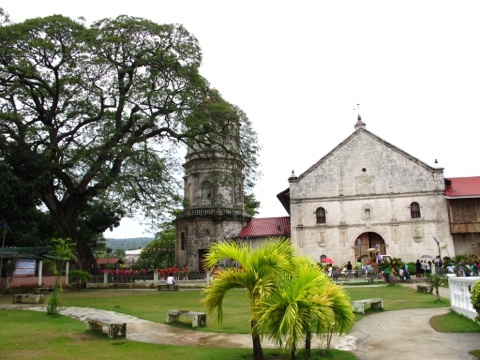 The Baclayon Church in Bohol is considered as the oldest stone church in the Philippines. 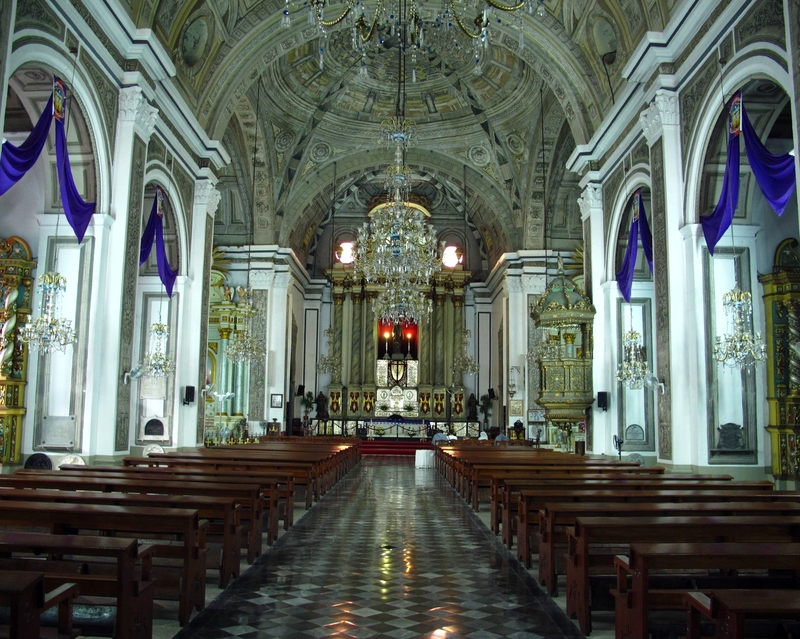 But some historians disagree, claiming that San Agustin Church in Manila deserves the title. 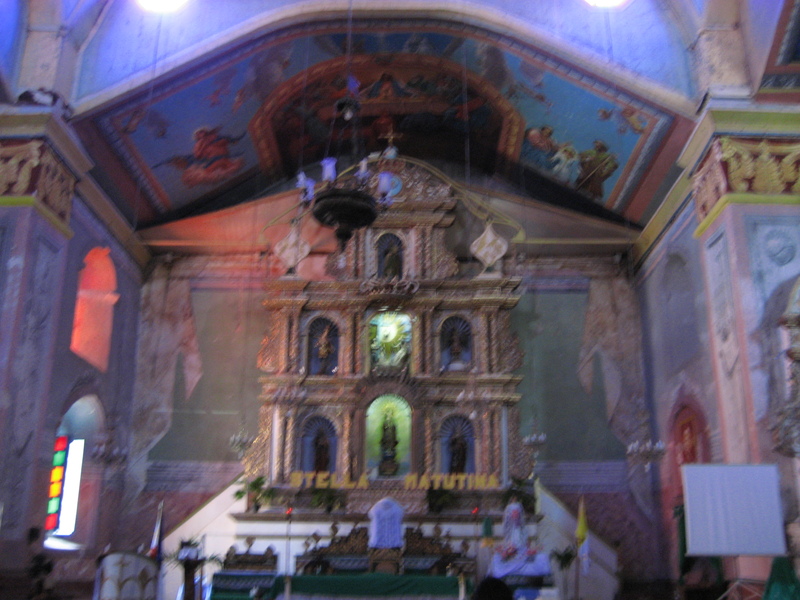 Church historians claim that the cornerstones of San Agustin Church were laid as early as 1571, 25 years before Baclayon Church was built in 1596. 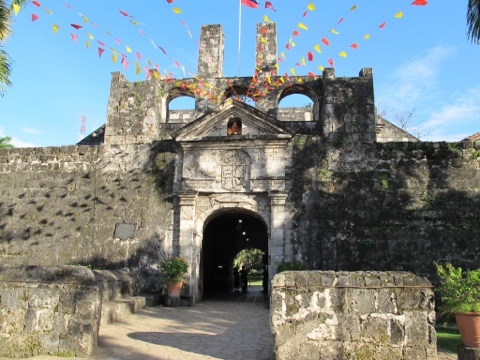 But most people believe the title should be kept by the latter, since it is situated in the island first occupied by the troops of Miguel Lopez De Legazpi, the country’s first Spanish governor general. The San Lazaro Hospital could be the oldest hospital in the country. 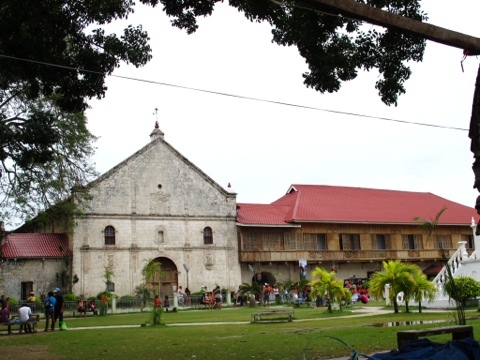 According to Pampango historian Zoilo Galang, the San Lazaro hospital was established in 1578; Enfermeria de Naga, 1583; and Hospital de San Juan de Dios, 1596. 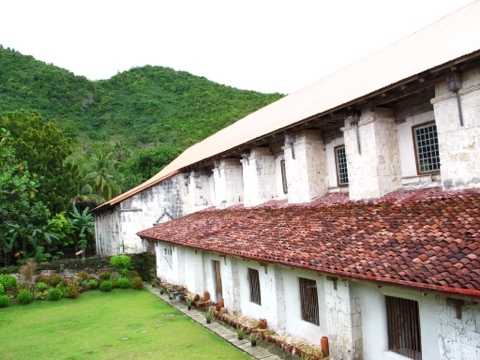 The oldest church bell in the country is said to be the one found in Camalaniugan, Cagayan. That bell was reportedly forged in 1595. The Jones Bridge, formerly known as Fuente de Espana, was first built in 1701. It was rebuilt by the Americans in 1916 and renamed after Atkinson Jones. The University of San Carlos (U.S.C.) 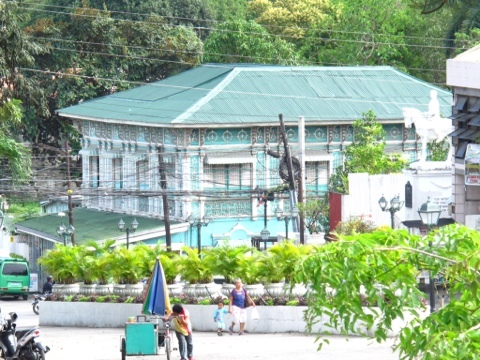 in Cebu City is considered as the oldest school in the country and in Asia. 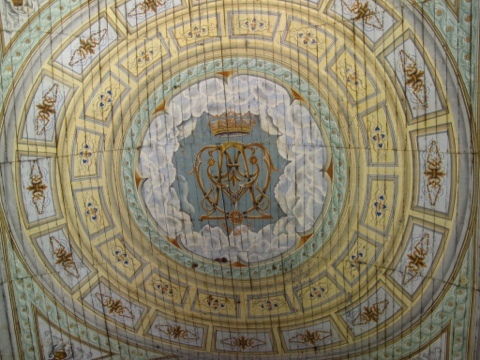 Formerly known as the Colegio de San Ildefonso, it was founded by the Spanish Jesuits on August 1, 1595. 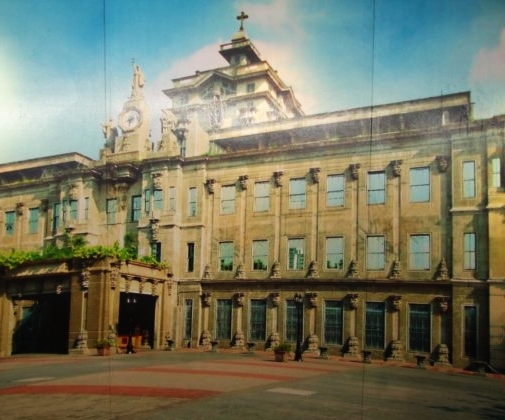 This makes the Cebu-based university older than theUniversity of Santo Tomas (1611) in Manila andHarvard University (1636) in the United States. The University of Santo Tomas, however, contests this title. Formerly known as the Colegio de Nuestra Señora Del Rosario,U.S.T. was the first school, which got a university status in 1645. U.S.C. became a university in 1948. UST also claimed that the original U.S.C. 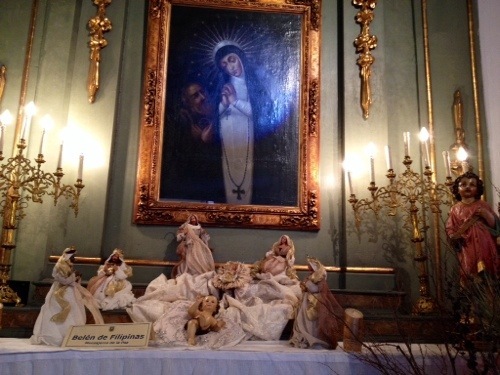 was closed in 1769 as a result of the expulsion of the Jesuits. It reopened in 1783 under a new name and ownership. But the USC officials stick to their claim. The university observed its 400th foundation day on August 21, 1995. The Don Honorio Ventura College of Arts and Trades (DHVCAT) inBacolor, Pampanga is said to be the oldest vocational school in Asia. Augustinian Friar Juan Zita and civic leader Don Felino Gil established the vocational school on November 4, 1861. Ayala Corp., one of the largest conglomerates in the country, is also the oldest existing company around. 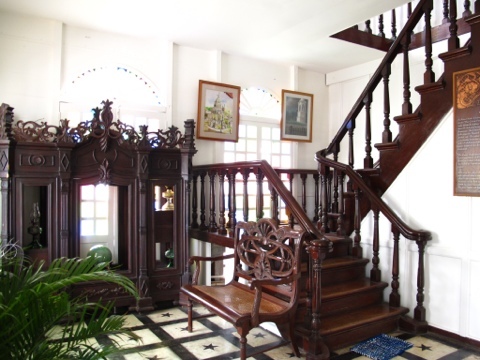 It was established in 1834 by sugar barons Domingo Roxas and Antonio de Ayala. It was later renamed as Casa Ayala, then as Ayala y Compania and recently as Ayala Corp. In 1881, Domingo Roxas, an ancestor of the Ayala family, became one of the first directors of Banco Español-Filipino De Isabel II,which was founded by virtue of a royal decree issued by Queen Isabel II. The bank issued the country’s first currency notes the following year. Considered as the first private commercial bank in the country, the bank came to be known as the Bank of Philippine Islands in 1912. 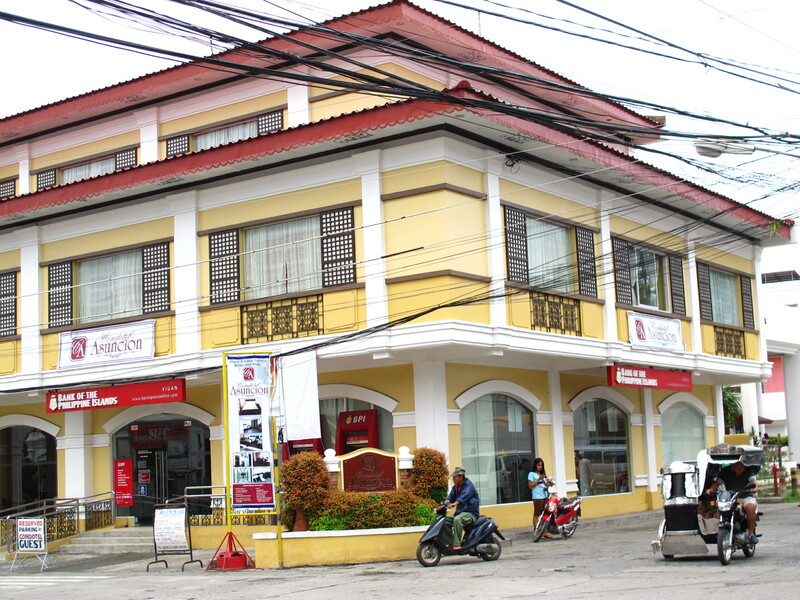 The oldest savings bank was Monte de Piedad, which was established in 1882. What can be considered as the oldest in the country is a 20-foot metal structure standing at a park in Daet, Camarines Norte. Its construction reportedly began on December 30, 1898 and was finished in February 1899. In comparison, the Rizal monument at the former Luneta Park was built in 1912. Insular Life Insurance Company was established on November 26, 1910, becoming the oldest insurance agency in the country.